We do a lot of talking about green and trying to convince clients to do it. And then we wait for the question that will eventually come…….. so what’s the premium that I have to pay for that? Not too long ago we had a client that took a big step. 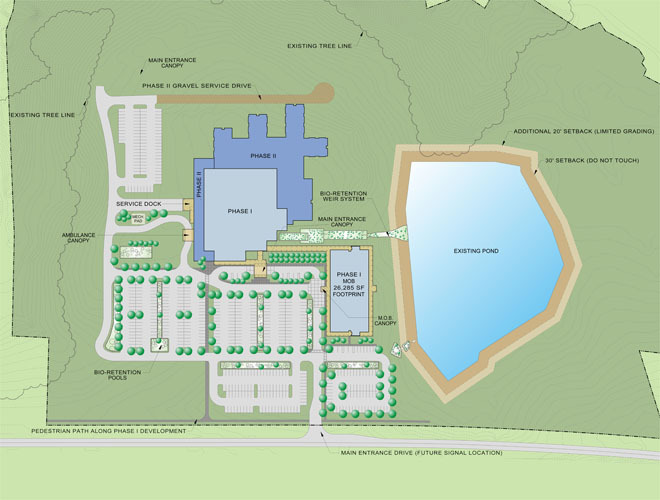 They commissioned us to have full schematic plans developed for their hospital site in North Carolina with both alternatives: green and conventional. The parameters, such as site area and number of parking spaces required, were the same. 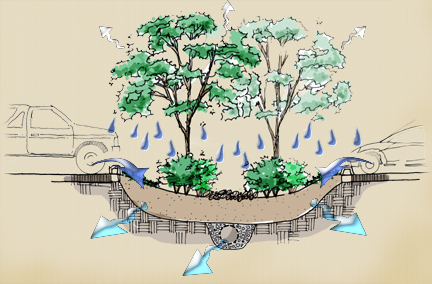 The conventional design used curb and gutter, catch basins, and underground piping to carry the water to detention ponds and/or the storm sewer system. 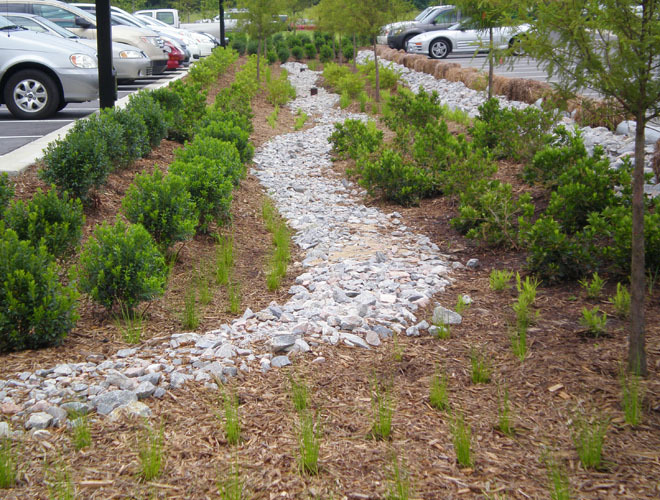 The “green” alternative used planted bioswales throughout the parking lot, curb stops at some parking spaces to allow for surface drainage into bioswales and a water collection system to divert the roof water into a channeled weir as an amenity which leads to the on-site pond. The general contractor priced both alternatives while we held our breath………… the green alternative checked in right at 3% less than the conventional plan for the overall site improvements. 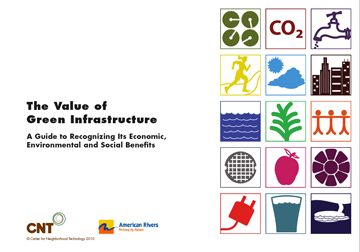 You might say that a 3% cost savings is not significant, but the green plan has the added advantage of making the site more aesthetically beautiful while meeting the stormwater needs. 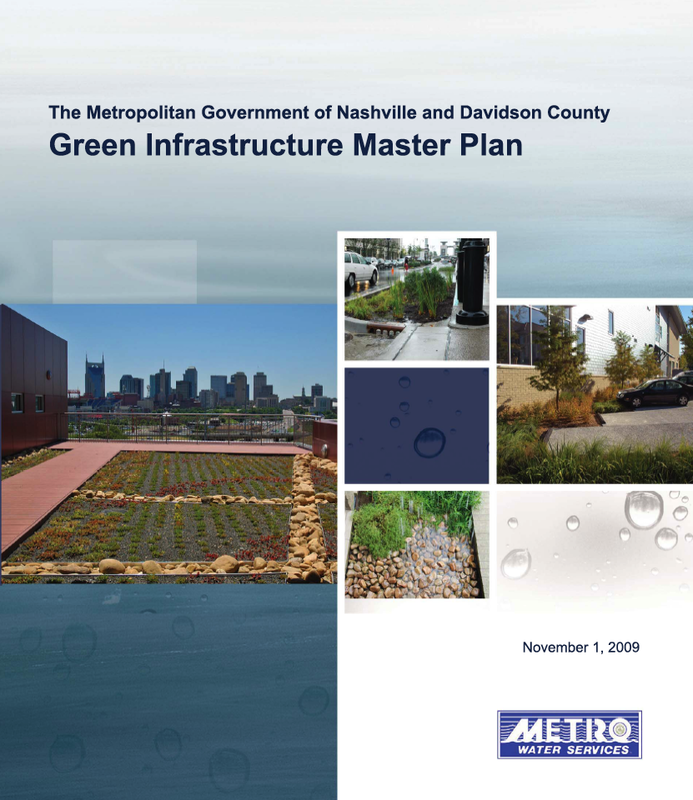 The conventional plan priced ordinance-required landscape only while the “green” plan provided considerably more landscaping (5x the ordinance plan) to densely plant the bioswales for water quality purposes while reducing sod and irrigation. 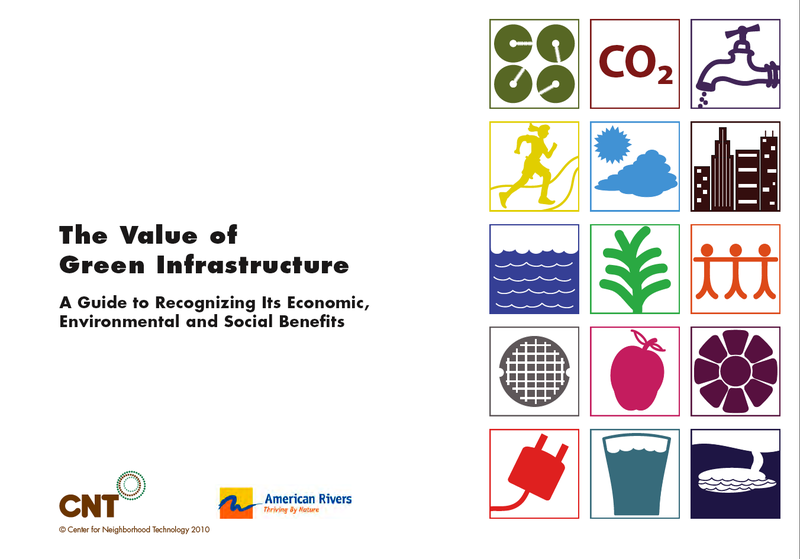 The additional benefits of this solution, beyond water quality and allowing for infiltration and recharge of the insitu soils, were providing wildlife habitat, reduction of life cycle costs through reduced maintenance and water cost for irrigation and a “free” water feature through the roof collection system diverted through a structured weir. Studies done by Texas A&M also show that views of landscape and natural systems also benefit the healing process, not to mention the mental health of the staff and visitors to the facility. An intangible that was also a factor was the speed with which the green alternative made it through the planning process and permitting. At Johnston Memorial Hospital in Clayton, NC, the total site area was approximately 75 acres. 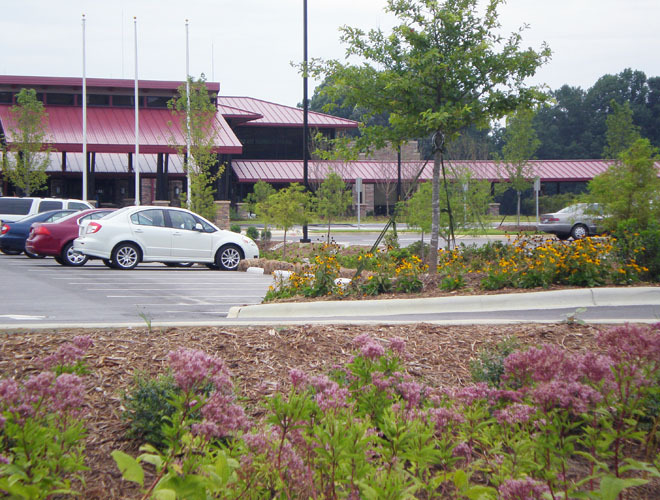 For the” green” plan, over 39,100 sf of the parking lot was designed as bioswales giving an impervious to pervious ratio of 4.5:1 (176,000 sf: 39,100 sf). 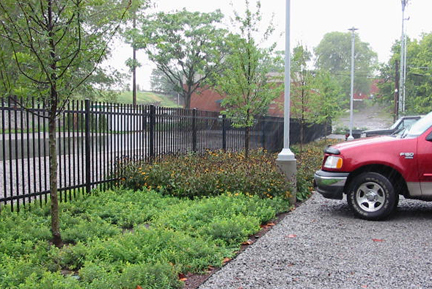 The bioswales were planted with almost entirely native plant material, which are well adapted for this situation. Plants like clethra, wax myrtle and itea formed a basis for the woody shrubs and native grasses and reeds like panicum, river oats and juncus added to the mix. Native perennials like aster, black-eyed susan and joe-pye weed add seasonal color without the replanting and maintenance cost of annuals. We appreciated having a client go through this exercise of comparison, and we love being able to provide a client with a solution that saves them money and is more sustainable for the environment at the same time.